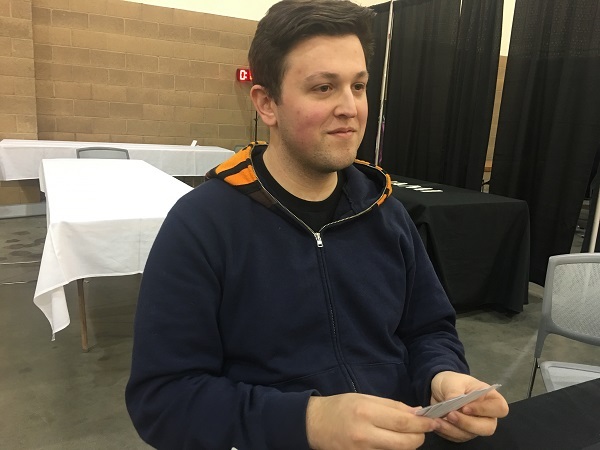 Philadephia’s Aaron Furman is a VIP Duelist in this weekend’s YCS, since he won the Ultimate Duelist Series – Invitational in Chicago back in 2016. That victory entitled him to 2 “Byes” in every YCS event, which means he started off this tournament with 2 free wins. 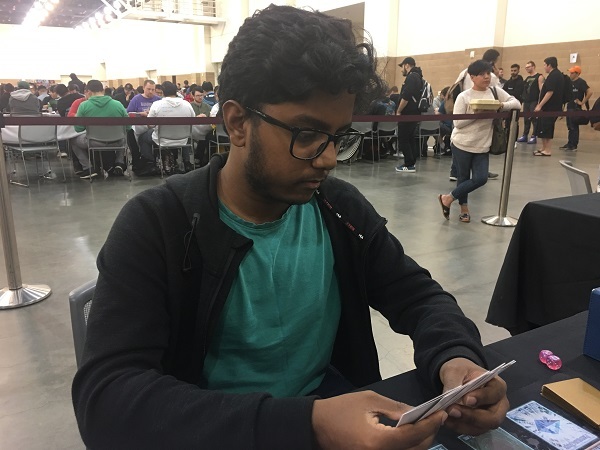 Now he’s sitting down for his first Match of the tournament with a 2-0 record, and about to face off against California’s Surya Kumaraguru and his explosive True King Dinosaur Deck! Furman is using a DARK Gouki Deck that aims to take a quick victory. One of these Duelists will advance with a perfect 3-0 record. It’s time to Duel! Kumaraguru won the die roll in Duel 1, but chose to go second. Furman opened up with Destiny HERO – Malicious, Knightmare Corruptor Iblee, Foolish Burial, Gouki Suprex, and Vision HERO Vyon. He activated Foolish Burial to send The Phantom Knights of Silent Boots and then banished it to add The Phantom Knights of Shade Brigandine to his hand. He Summoned Suprex, Set Shade Brigandine, and then flipped Shade Brigandine to Special Summon it. He combined his 2 monsters to Link Summon Isolde, Two Tales of the Noble Knights and used the effects of Isolde and Suprex to add Headbatt and Blue Mountain Butterspy from his Deck to his hand. Next, he used Isolde’s effect to send 3 Equip Spell Cards including a Divine Sword – Phoenix Blade from his Deck to his Graveyard to Special Summon Neo-Spacian Aqua Dolphin. He discarded Malicious from his hand to activate Aqua Dolphin’s effect, and used its effect to destroy a Ghost Belle & Haunted Mansion in Kumaraguru’s hand. Next, Furman banished a Malicious from his Graveyard to Special Summon another from his Deck and combined Isolde with Malicious to Link Summon Summon Sorceress. He used its effect to Special Summon Iblee to Kumaraguru’s field, then tried using its effect to Special Summon a monster to his own field, but lost out to Ash Blossom & Joyous Spring. He banished another Malicious from his Graveyard to Special Summon his last one from his Deck and then passed his turn. Kumaraguru switched Iblee into Attack Position and attacked Summon Sorceress with it, destroying the Iblee in battle and losing 2400 Life Points. In Main Phase 2, he activated Double Evolution Pill. He banished Ghost Belle from his Graveyard and Ultimate Conductor Tyranno from his hand to Special Summon Ultimate Conductor Tyranno from his Deck and then passed his turn. Furman drew Ghost Reaper & Winter Cherries and then used Aqua Dolphin’s effect. He discarded Ghost Reaper from his hand to destroy True King Bahrastos, the Fathomer from Kumaraguru’s hand, and Bahrastos’s effect activated to Special Summon True King Agnimazud, the Vanisher from the Deck in Defense Position. Furman Link Summoned Knightmare Cerberus next, and used its effect to destroy Ultimate Conductor Tyranno. Next, he Normal Summoned Headbatt and Special Summoned Blue Mountain Butterspy. He then combined Summon Sorceress with Headbatt to Link Summon Firewall Dragon Linked to Knightmare Cerberus, and added Gouki Re-Match to his hand with Headbatt’s effect. 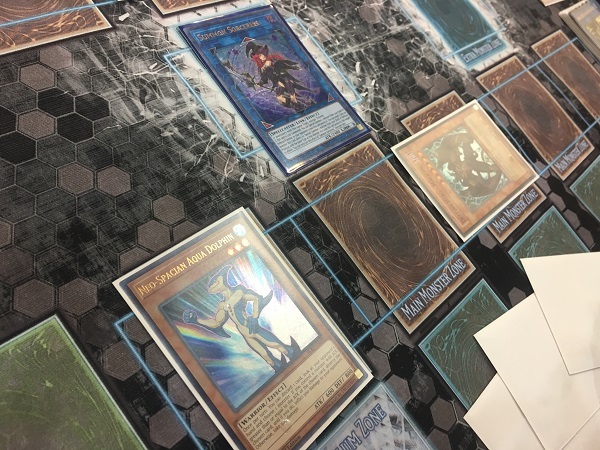 He banished Malicious and Vyon from his Graveyard to return Phoenix Blade to his hand, used Gouki Re-Match to Special Summon 2 monsters from the Graveyard, and then combined Suprex with Butterspy to Link Summon Underclock Taker. He used Suprex’s effect to add Gouki Twistcobra from his Deck to his hand. 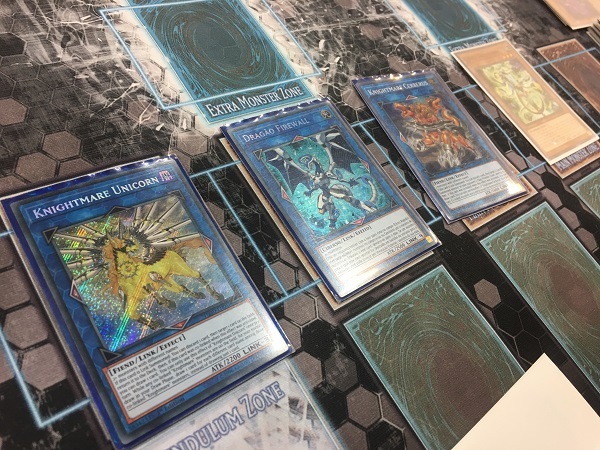 He combined Underclock with Headbatt to Link Summon Knightmare Unicorn and then used the Unicorn’s effect to return Agnimazud to the Deck and draw a card. He Special Summoned Twistcobra from his hand with Firewall’s effect, and then direct attacks from Knightmare Unicorn, Firewall Dragon, Knightmare Cerberus, and Gouki Twistcobra ended the Duel! Aaron Furman wins the first Duel with his DARK Gouki Deck! Kumaraguru chose to go first in Duel 2. He activated Fossil Dig to add Miscellaneousaurus to his hand and then activated Dragonic Diagram. He used its effect to destroy Babycerasaurus from his hand and grab True King Bahrastos, the Fathomer from his Deck, and then tried to activate the effect of Babycerasaurus; but Furman activated the effect of the PSY-Framegear Gamma in his hand to negate the effect and Special Summon the Gamma from his hand along with a PSY-Frame Driver from his Deck. Next, Kumaraguru discarded Miscellaneousaurus from his hand to use its effect and then banished it along with a Babycerasaurus in his Graveyard to Special Summon a Babycerasaurus from his Deck with Miscellaneousaurus’s effect. After a number of incredibly fast moves involving his Dinosaur monsters, he had Special Summon Agnimazud and Synchro Summoned Trishula, Dragon of the Ice Barrier! He used its effect to banish Headbatt from Furman’s hand and Gamma from his field, and then he combined Trishula with Agnimazud to Xyz Summon True King of All Calamities! He then ended his turn. Furman drew a card and then had Soul Charge, Divine Sword – Phoenix Blade, Junk Forward, and Armageddon Knight in his hand. In his Draw Phase, Kumaraguru used the effect of his True King of All Calamities, declaring the DARK Attribute, to stop DARK monsters from using effects. Furman ended his turn, knowing that he was unlikely to survive another turn, but hoping that if he could, he may be able to turn the Duel around. But Kumaraguru Summoned Souleating Ovirpator next turn and Special Summoned Ultimate Conductor Tyranno! Direct attacks from Oviraptor, Tyranno, and True King of All Calamities wiped out all 8000 of Furman’s Life Points! Surya Kumaraguru wins Duel 2 on his second turn with his Dinosaurs to push the Match against the UDS Champion to a third and final Duel! Furman opened up Duel 3 with Gouki Re-Match, Foolish Burial, Called by the Grave, Junk Forward, and The Phantom Knights of Shade Brigandine. He Special Summoned Junk Forward and then used Foolish Burial to send Malicious to his Graveyard. He banished it to Special Summon another Malicious from his Deck and combined both monsters to Link Summon Isolde. He used its effect to search his Deck for a Warrior, and when Kumaraguru tried to destroy Isolde with Ghost Ogre & Snow Rabbit, Furman Chained Called by the Grave to banish Ghost Ogre and protect Isolde. 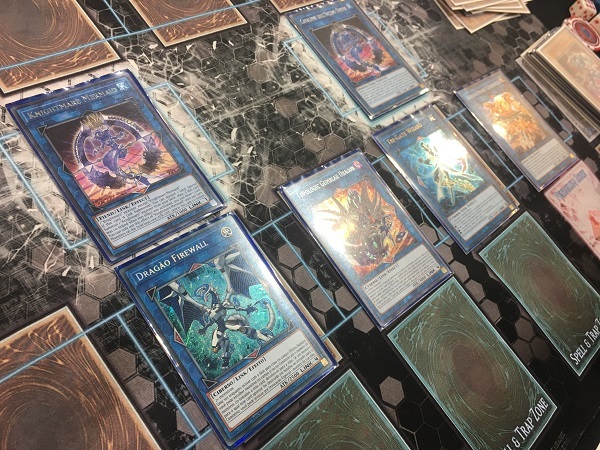 Furman added Junk Forward to his hand with Isolde and then used Isolde’s effect to Special Summon Aqua Dolphin from his Deck by sending Phoenix Blade, Living Fossil, and D.D.R. – Different Dimension Reincarnation from his Deck to his Graveyard. He discarded Junk Forward to use Aqua Dolphin’s effect, revealing Jurrac Dino, Dragonic Diagram, Double Evolution Pill, and Overtex Qoatlus in Kumaraguru’s hand. Furman couldn’t destroy any of them, so he lost 500 Life Points. Furman Special Summoned another Malicious from his Deck by banishing 1 from his Graveyard next, then combined it with Isolde to Link Summon Summon Sorceress. He used Sorceress’s effect to Special Summon Gouki Headbatt from his Deck, then combined Headbatt with Aqua Dolphin to Link Summon Knightmare Phoenix. He used Headbatt’s effect to add Gouki Twistcobra to his hand and then Normal Summoned it. He combined it with Sorceress to Link Summon Firewall Dragon co-Linked with Knightmare Phoenix, then used Twistcobra’s effect to add Suprex to his hand. He banished 2 Warriors from his Graveyard to add Phoenix Blade from his Graveyard to his hand and then used Knightmare Phoenix as a Link Material to Summon Knightmare Mermaid in his Extra Monster Zone, co-Linked to Firewall Dragon. He used the effects of Knightmare Mermaid and Firewall Dragon, and after a flurry of plays involving Firewall Dragon’s effect, Furman had Extra Linked with Topologic Gumblar Dragon! Kumaraguru discarded 2 cards from his hand. Next, Furman continued making plays, improving his Extra Link so that Tri-Gate Wizard was co-Linked to 3 monsters. He Set Shade Brigandine and then passed his turn. 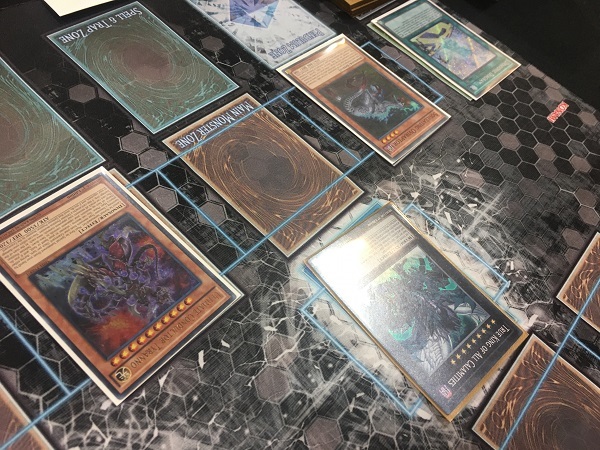 Kumaraguru drew a card and Furman flipped The Phantom Knights of Shade Brigandine, Special Summoning it in a zone to which Firewall Dragon’s Link Arrow pointed. Furman then used the effect of his Gumblar Dragon and discarded a card to force Kumaraguru to discard a card. Kumaraguru conceded immediately, staring down an Extra Linked field with virtually no cards at his disposal. Aaron Furman advances with a 3-0 record with his DARK Gouki Deck!